Enjoy this lovely vacation rental home located in Lutsen, MN on Caribou Lake. 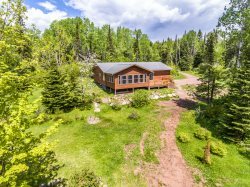 Tucked within the maple forest of Lutsen, with historic White Sky Rock serving as your backdrop, combined with Caribou Lake as your backyard, what more do you need? Maple Haven is a beautifully appointed vacation home and is just 4 miles from "downtown Lutsen", but feels like a world away. Maple Haven is a three bedroom, two bathroom, two level home, but offers so much more than just a place to stay. Located on the very popular Caribou Lake, it's an ideal location for boating, fishing, and swimming, In addition, you have a large grassy yard and easy access to the larger lake. Cathedral of the Pines summer camp is next door and you can often hear the sounds of kids laughing and playing, but still have plenty of peace and privacy. The home also boasts a two-person jetted tub in the master bedroom and a sauna in the lower level living room area. This home is great for families with two living spaces- one for the adults and one for the kids - to enjoy, but also has a large living area for everyone to come together and enjoy spending quality time on the North Shore. At Maple Haven, you may arrive and never want to leave! Should you choose to, however, you will find this home is close to a wide variety of activities and restaurants. You are conveniently located near Lutsen Mountain Recreation Center that has an alpine slide and a gondola to ride up to the summit of Moose Mountain. There you can enjoy sweeping views of Lake Superior. The Superior National Golf Course, with Lake Superior as your backdrop, is also just a few miles away. Many Federal and State park trails, including Cascade State Park with its easy hike to a beautiful waterfall, and the shores of Lake Superior are just minutes away. For a night out, experience live music at Papa Charlie's, Lutsen Resort, or many of the dining options in Lutsen and Grand Marais which often feature live music on weekends. Be sure to check out the activities calendar available at most restaurants to find out what's going on during your stay.